Property remains a great long term investment. If you’re a homeowner, there are some easy ways of outperforming the market and adding value to your home. If you have some spare cash and you don’t fancy seeing it wallow in a bank account accruing minimal interest, why not invest it into some home improvements that will boost the value of your home. Whether you are planning to sell up in the next twelve months or you are holding onto your humble abode for the next twenty years, a well-managed scheme of home improvements can only enhance your property. What is the first thing that people see when they visit your home? It’s not the entrance hall or the kitchen or even the front door, it’s the vista of your entire house. Nothing looks more odd than when you see a property with a mismatched facade or paint peeling window frames. It’s time to enhance your home’s curb appeal to get people talking about your pad for all the right reasons. The front door and garage door to your home should match. They could share the same color, material or texture. Homes with an up and over garage door in a gun metal finish should also have a metallic composite front door with minimal glazing. If you have injected some color into your front door, don’t opt for a contrasting hue on your garage door. Remember the old adage: red and green should never be seen. Aesthetically your roof can look attractive to the eye with a red tile finish, a reclaimed slate look or a contemporary sheet metal design. More importantly, your roof needs to be in good order, so there are no insulation issues or problem leaks. Companies like Community Roofing & Restoration are specialists in providing a bespoke roofing service. As well as replacing your roof, they can install skylights to inject more visual appeal to your facade and improve guttering. Ensure that the roof to your home echoes the quality of the rest of your property. There is often no need to replace windows, you just have to spruce them up a little bit. Make sure they are cleaned regularly, free from cobwebs and smears. If there’s any peeling paint on the window frames, whip out the paintbrush and refresh the color. This will give your home’s facade an instant facelift. If you’re lucky enough to have a small lawn or garden area in front of your home, head down to the garden center and purchase some bright plants to make over the external area of your pad. Even if your front door is not set back from the road, you can still adorn your front door with a hanging basket of greenery or place a bonsai next to your porch to create a more vibrant look. Using these tips to inspire the enhancement of your home’s curb appeal will result in a good investment of your hard earned cash. You’ll see an instant boost to the value of your property, and you can watch with delight as heads turn when people wander past your home. Nothing beats the feeling of coming home to a cozy and inviting home. They say that home is where the heart is, and your home should be somewhere that makes you feel safe and warm. Warmth isn’t just a physical feeling; it’s a state of mind too. Creating the right atmosphere in your home can make you feel safer and happier, and the good news is that it’s easy to achieve. Take a look at some simple ideas for creating a warm and welcoming home below. The trend for many of today’s modern homes features lots of white, greys and generally ‘cool’ shades. While this creates a sleek and stylish look, it can make a home feel somewhat cold. Adding in some warmer colors including deep shades of reds, purples, and browns can create a feeling of warmth and doesn’t need to involve a huge overhaul of your home. Making simple changes like adding in new curtains or some colorful cushions will help. If you can’t alter your colour scheme, try bringing in some different textures like wool, linen, and faux fur is a simple way to create the feeling of coziness. Scandinavian design trends use many different colors and textures to add warmth without compromising on style, so you can learn a lot from these types of interiors. Hygge is a Danish concept relating to ‘coziness.’ In recent years it has really taken over, the New Yorker describes it as wholesome and nourishing and can include many different elements to make your home a sanctuary. Rather than focusing on decor, the concept embraces comfy clothing, candles, and comforting foods and drink as a way to relax and feel happy. You can find plenty of ideas for living more ‘hygge’ on Pinterest or in the many books that have been published on the subject in the last year. An easy way to create more warmth in your home is to change your heating. More people are embracing fireplaces and stoves to not only heat their homes but to create a cool design feature too. If you’re concerned about the smell and caused by wood, you could consider investing in a pellet stove instead which heats just as effectively, but with less mess and smoke than a wood burner. You can also pick up pellet stove parts for less than wood or coal and enjoy the fantastic feeling of relaxing in front of the stove at night. Changing your heating comes at a cost, but it’s one worth having to enjoy a warmer, more welcoming home. Transforming your home to be warmer and more inviting isn’t as difficult as it sounds. You can start by making your bedroom a more comfortable place to sleep and working from there. Having a house or apartment you look forward to coming home to is one of life’s pleasures, so start making changes and enjoy your warm, cozy living space. Parents understand the importance of leading a healthy life and encouraging children to do the same. The problem is that a lot of children don’t understand why being healthy is so important; all that most kids can think about is how something tastes or how much fun playing video games is compared to running around outside. While most kids are fussy about eating their greens, the fact is that it’s vital that as they get older, they begin to understand the importance of putting their health first. As well as why they should make an effort to do so. The question is, as a parent how can you ensure that your children grow up understanding why making healthy choices is so important? Here are some suggestions to make raising healthy kids that little bit easier. Kids learn from what their parents do, which is why it’s so important that as a parent you lead by example. Want your children to grow up to be healthy adults that understand the importance of clean eating and exercise? Then it’s vital that you lead by example; always make healthy choices and encourage your little ones to do the same. The chances are that if your children see you making healthy choices, they will be more likely to do the same. Try to choose fruit rather than chocolate and cake, make your meals from scratch instead of buying ready made meals or take out, and make an effort to exercise regularly. Whether you realize it or not, your kids are watching what you do and will follow the example that you set for them. Ensure that your cupboards are always fully stocked with a selection of healthy foods and drinks. From ingredients for family meals to snacks, it’s important to ensure that you always have lots of healthy options in your cupboards and fridge. Don’t forget to also stock up on healthy drinks. Give sugary sodas a pass and instead stock your cupboards with mineral water, organic juices and flavored bottled water packs. To ensure that healthy food doesn’t get boring, take inspiration from photo sharing sites like Pinterest - there are some great healthy lunch, dinner and snack ideas on there. 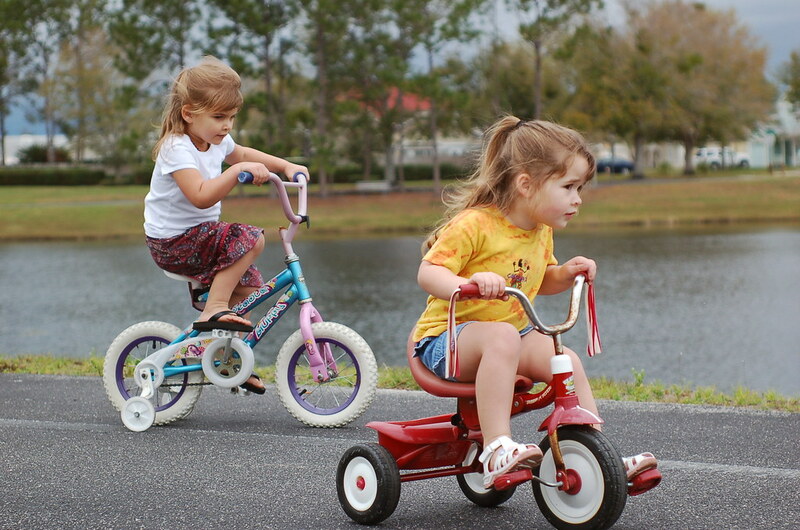 Studies have shown that children who grow up in active families are more likely to develop into active adults. That’s why it is so important that as a parent you make sure that your family is as active as possible. Don’t spend weekends at home in front of the TV, plan family outings instead. Whether you go on hiking trips, for bike rides, or swimming at your local pool, it doesn’t matter, what matters is that you ensure your family is as active as possible. The fact is that raising kids that take being healthy seriously isn’t always an easy task. However, if you take note of the tips above and implement them in how you raise your kids, you can increase the chances that your children will take their health seriously as they grow up. About four and a half hours from us, there's a time capsule of sorts. It's a huge attraction, with locations in several different cities in America. Once you enter the doors of this huge castle, you are transported to a different time, a different realm. A time where knights fought to protect their king, win the favor of the princess, and keep the kingdom peaceful. We've visited this attraction several times, and if you've never been to Medieval Times, you need to find your closest castle and book a reservation! Of course, in addition to the show, you get a wonderful dinner as well which makes it even better! I think Medieval Times is a great family attraction, and I'm sure anyone who has ever been to a castle will agree. Plan to arrive at least an hour before showtime to give yourself time to check-in and then wander the gift stands in the main hall. You can wander the hall to se the horses, enjoy the medieval decor, and purchase some souvenirs. You'll also enjoy seeing the knighting ceremony where youngsters are "knighted" and get a picture with the king. Once the chancellor appears, the real fun begins-getting seated! Once seated (this is decided by which color section you are in), your server for the evening (a serf or wench) will come and take your drink order. The show begins soon after, while you're enjoying blood soup (tomato) and garlic bread. As the evening continues, more and more food is served, and I'm pretty sure with all the times I've been, I've never once completely finished my meal! Baby dragon, dragon ribs, roasted potatoes, and apple turnover for dessert (I've been known to steal leftover turnovers from the family too!). While the meal is an attraction in itself, what we're really there for is the show. You will be astounded as you watch the beautiful horses dancing, the hawk flying right over your head in pursuit if his prey, and the tricks the knights perform on horseback. This all ends with duels, and eventually, a chance for the victorious knight to fight (and of course defeat) the challenger from another country. By the time the show ends, you will be cheering right along with everyone else!